Ardyth M. H. Gillespie, Ph.D. recently retired after serving for 34 years on the faculty of the Community Nutrition Program in the Division of Nutritional Sciences at Cornell. 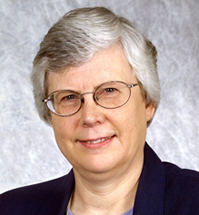 She currently holds the titles of visiting faculty member in the Division, Collaborator Faculty member in the Department of Food Science and Human Nutrition at Iowa State University, and co-founder and director of the Collaborative Leadership Institute, CoLead. In her scholarly career she has bridged academic research, extension, and practice through her work in family and community food decision making and university-community collaboration and engagement. Her mission is seeding thoughtful systems change to foster health and well-being with collaborators in the Family and Community Food Decision-making (FDM) Program. (familyfood.human.cornell.edu). The FDM program bridges academic research and teaching, practitioners, and extension/outreach. Gillespie continues leadership development, mentoring, and collaborative engaged research activities for moving toward the long-term goal of nourishing and nurturing children and their families across generations. The work and impact of the family and community food decision-making program continues through the international food decision-making network of faculty, students, and other partners in U.S. communities and academic institutions, Canada, Taiwan, Korea, Hong Kong and the Philippines. Gillespie’s current collaborative leadership roles include co-chairing the leadership team of the Journal of Agriculture, Food Systems, and Community Development in its transition to a new publishing model; council member and chair of the strategic planning committee for the Agriculture, Food and Human Values Society; publications coordinator for the Multi-state research team, Food systems, health, and well-being: understanding complex relationships and dynamics of change, and serving on the advisory committee for Groundswell Center for Local Food and Farming and she is the external evaluator for a USDA funded capacity building project. Gillespie’s research is focused on family and community food decision making from a systems perspective and on developing transdisciplinary research methodology for collaborative engaged research (CER). CER is conducted in partnership with community food system stakeholders, change leaders, and scholars. Her research addresses the foundational mechanisms of collective food decision-making in families and communities, including facets of communication competence, presuppositions, alternative pathways, and change strategies. She seeks to create generative environments which foster innovative leadership for promoting more sustainable food systems that also foster improved health and well-being and, at the same time, build family and community capacity for nourishing and nurturing children and their families across generations. The family food decision making system framework (Gillespie and Johnson-Askew, 2009), which brings together experiential knowledge with quantitative and qualitative research, is guiding current CER and its application. CER integrates research with campus teaching and community-based practice (extension/outreach & public engagement). Key outcomes and impacts of CER include understanding and fostering relational as well as instrumental communication competence within leadership teams, within families, with thought leaders, and in relationships between change leaders and families. These findings are discussed in, Enhancing Interdisciplinary Communication: Collaborative Engaged Research on Food Systems for Health and Well-Being (Gillespie & Sung. Chapter 8 in Enhancing Communication and Collaboration in Interdisciplinary Research. Editors, Michael O'Rourke, Stephen Crowley, Sanford D. Eigenbrode, and J. D. Wulfhorst, Sage publications, 2013). Gillespie studies the Family Food Decision-making System (FFDS) and related family dynamics, and develops methodology for Collaborative Engaged Research (CER). Her current focus is on enhancing communication for transdisciplinary and multi-sector research. In collaboration with social scientists and community-based partners, Gillespie has developed a conceptual framework which describes the pathways and critical decision-junctures and impetuses for engaging in rethinking eating practices and food choices (Gillespie & Johnson-Askew, 2009). This framework serves as a heurisitc for organizing and conceptualizing research and experimenting with change strategies which integrate research with practice. She leads teams in studying family dynamics of the system including food and eating roles and interactions as well as components of the thoughtful family food decision-making pathway. CER teams experiment with approaches for fostering sustainable change by increasing capacity of families and communities for thoughtful food decision-making. CER emphasizes methods for the collaborative generation of grounded theory which focuses upon conducting research with rather than on families and communities and thereby increasing the validity and value of the research. At the same time, this approach facilitates the application of research in community-led programs. Gillespie facilitates CER leadership teams advancing the development of methodology and adding to the research base of Family and Community Food Decision-making. These include leadership teams for Cooking Together for Family Meals (Kathy Dischner, Holly Gump, Cheryl Neal, Rebecca Crawford, Tina Foster, Loree Symonds, Jonathan Sterlace, Christine Gutelius, and Helen Howard). Leveraging the Locavore Movement: Exploring Family and Community Food Decision-making, (Paul Curtis PI, Keith Tidball, Moira Tidball, and Cornelia Flora, ISU); the multi-state leadership team for Food Systems, Health, and Well-being: Understanding Complex Relationships and Dynamics of Change (NC1196). Gillespie, Ardyth H. and Guan-Jen Sung (2013). Enhancing Interdisciplinary Communication: Collaborative Engaged Research on Food Systems for Health and Well-Being. Chapter 10 in: Enhancing Communication & Collaboration in Interdiscipolinary Research, Michael. O'Rourke, Stephen. Crowley, Sanford. Eigenbrode and J.D. Wulfhorst. IN PRESS. Flora, Cornelia and Ardyth Gillespie. (2009) Making Healthy Choices to Reduce Childhood Obesity: Community Capitals and Food and Fitness. Community Development, 40:114-122. Gillespie, A. H. (2008). "Family Food Decision-making and Obesity." Invited emperical paper for NIH National Institute for Child Health and Development Invitted workshop on Feeding Families: Bridging Social Sciences and Social Epidemiology Aproaches to Obesity Research, July 9, Rockville, MD. Gillespie A, Smith L. Food Decision-making Framework (2008), Connecting Food Systems to Health and Well-being. Journal of Hunger and Environmmental Nutrition 3:328-346. Gillespie A. Generating grounded theory with community partners. Journal of Community Nutrition, 81:16, 2006. Achterberg, C. L., J. D. Novak, et al. (1985). "Theory-Driven Research as a Means to Improve Nutrition Education." Journal of Nutrition Education 17(5): 179 - 184. Gillespie, A. H., L. Ganter, et al. (2003). "Productive Partnerships for Food: Principles and Strategies." Journal of Extension 41(No. 2). Gillespie, A. H. (2003). "The Evolution of Community Nutrition in the U.S." Journal of Community Nutrition 5(4): 195-208. Son, S. M., A. Gillespie, et al. (2002). "Diet Related Factors Influencing BMI Changes for Korean-Americans Residing in Eastern Area of America." Journal of Community Nutrition 4(2): 90-98. Park, D.-Y., S.-G. Rhie, et al. (2002). "A Survey on Korean Families' Food Decision Making: Purchase of Fresh Fruits and Vegetables." Journal of Food Science and Nutrition 7(1): 95-104. Gillespie, A. H. (2002). "Neighborhood Watch: How Your Community Affects Your Food Choices." Journal of Family and Consumer Sciences 94(4): 66-67. Gillespie, A. H. (1998). "Developing a University-Community Partnership Model Integrating Research and Intervention to Improve Food Decisions in Families and Communities." Korean Journal of Community Nutrition 3(1): 120-132. Gillespie, A. (1997). "President's Message: On Community Empowerment." Journal of Nutrition Education 29(2): 55-56. Shafer, L., A. Gillespie, et al. (1996). "Position of the American Dietetic Association: Nutrition Education for the Public." Journal of the American Dietetic Association 96(11): 1183-1187. Gillespie, Ardyth M.H. (2013). Enhancing Interdisciplinary Communication in Collaborative Engaged Research: Sustainable of Food Systems for Health and Well-Being. Accepted for Publication in: Enhancing Interdisciplinary Communication, S. Crowley, S. Eigenbrode, M. O'Rourke, and J. Wulfhorst. Gillespie, A. H. (1996). "Leadership through Diversity: Gateway to Change (President's Column)." Journal of Nutrition Education 28(5): 247. Gillespie, A. H. and J. K. Brun (1992). "Trends and Challenges for Nutrition Education Research." Journal of Nutrition Education 24(5): 222-226. Brun, J. K. and A. H. Gillespie (1992). "Nutrition Education Research: Past, Present and Future." Journal of Nutrition Education 24(5): 220-221. Kirk, M. and A. Gillespie (1990). "Factors Affecting Food Choices of Working Mothers with Young Families." Journal of Nutrition Education 22(4): 161-168. Gillespie, A. and L. Shafer (1990). "Position of The American Dietetic Association: Nutrition Education for the Public." Journal of the American Dietetic Association 90(1): 107-110. Gillespie achieves her mission of seeding thoughtful systems change to foster health and well-being by creating learning environments to expand human potential and build family and community capacity for fostering health and well-being and through the integration of research, campus education, and extension/outreach. The long-term goal of these scholarly activities is to build family and community capacity for nourishing and nurturing children across generations. She pursues three overlapping and mutually supportive areas of extension/outreach: food decision-making with an ecosystems perspective, collaborative leadership development, and developing Collaborative Engaged Research (CER) methodology with community-based collaborators. Gillespie seeks to understand and strengthen the connections among sustainable food systems, food decision-making, and health and well-being in the context of CER. She is currently engaged in expanding the intersection and depth of engagement and collaboration among researchers and practitioners through: 1. Co-chair of the leadership team for the Journal of Agriculture, Food Systems, and Community Development. This online international, peer-reviewed publication focuses on the practice and applied research interests of agriculture and food systems development professionals. The Journal "emphasizes best practices and tools related to the planning, community economic development, and ecological protection of local and regional agriculture and food systems, and works to bridge the interest of practitioners and academics." 2. Co-chair of visioning and strategic planning for Agriculture, Food, and Human Values Society, and the multi-state leadership team for Food Systems, Health, and Well-being: Understanding Complex Relationships and Dynamics of Change (NC1196). 3. Engagement with community initiated food systems change initiatives including Groundswell Center For Local Food and Farming and Harrisdale Homestead community-based center for food education and research.